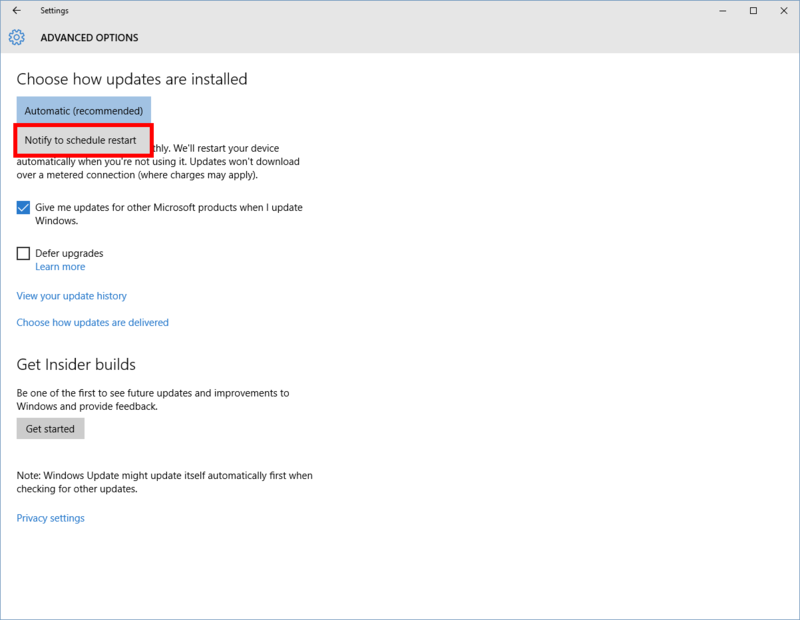 You can't choose which updates to download in Windows 10, but you do have a say about when they're installed. Windows 10 is here, and with it a change that may surprise some home users used to handling Windows updates on their own. 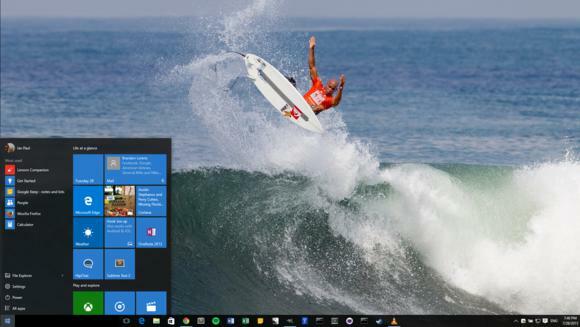 Microsoft will not support manual updates on Windows 10 Home PCs. Instead, all updates are automatically downloaded to your machine and then scheduled to install when your PC is idle. There are some exceptions and workarounds to that, but for most of us updates are a mandatory affair. 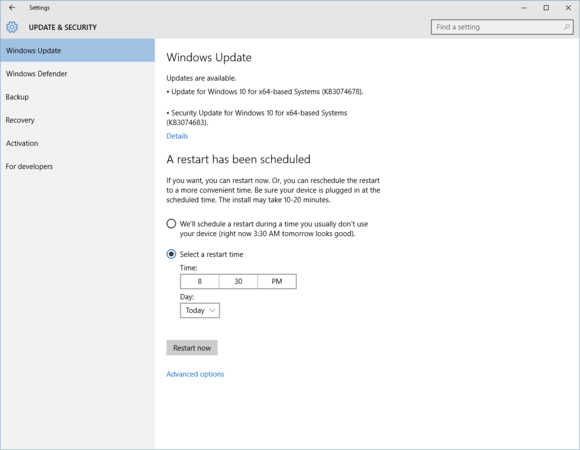 The one thing that Microsoft will let you do, however, is decide when your system actually restarts to install the updates. In Windows 10, you can schedule when your PC will reboot to finish installing updates. The Settings app in the Windows 10 Start menu. First, click on the Start menu, open the Settings app, and select Update & security > Windows Update. As you can see on the screen above there’s already an option to select a restart time to finish installing an update. But we want to make sure we get notified every time the system requires a reboot. That we don’t have to constantly check-in with the Settings app to see if an update is ready for installation. Click on Advanced options at the bottom of the Windows Update screen. At the top of the next screen you’ll see a drop down menu under Choose how updates are installed. Click the drop down and select Notify to schedule restart. Now, hit the back button in the upper left corner of the Settings app to return to the previous screen. If an update is ready to go, click the Select a restart time radio button and adjust the fields to your liking. You can choose any time in the next week to restart your system. If you’d rather restart right away there’s a Restart now button towards the bottom of the screen. Keep in mind this tweak does not pause update restarts, it only notifies you that a restart is required soon. Windows will schedule its own reboot first, and you must override it manually by scheduling your own. With Windows 10, Microsoft is switching to the concept of “Windows as a service.” Under this model, the OS is never “done.” Instead it will continually receive feature updates, as well as Microsoft’s usual security patches. At least that’s what Microsoft says will happen. 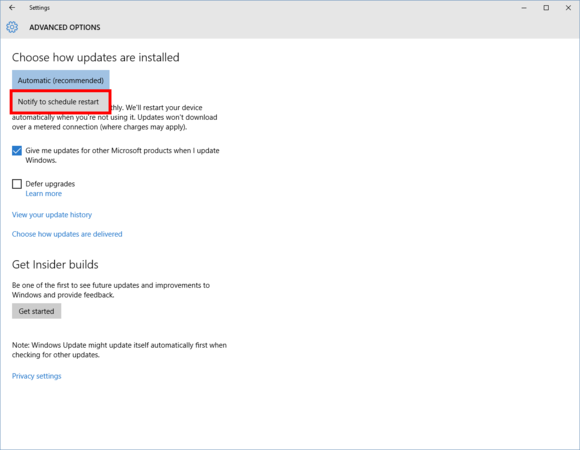 For regular users, the basic takeaway is that you must stay current with Microsoft’s latest updates as they roll out. There is a power user utility to manually block specific updates if they mess up your system, and you can get around silently downloaded updates if you’re on a metered connection. For the most part, however, you must take the updates as they come. That may not be much of a change for most of you, as Windows 7 and 8.1 both have automatic update features that silently download and install changes in the background. The difference in the older systems compared to Windows 10 is that Microsoft offered a manual update option—which no longer exists.